Cactus has always been proud of the teachers who work for us, as they are all carefully selected for their skills, experience and personality. This month we are delighted that our Brazilian Portuguese teacher Ian Costabile, based in Liverpool, has published an excellent book to help students learn Portuguese. Três Histórias Diferentes para Aprender Português, or ‘Three Different Stories to Learn Portuguese’, is a collection of three stories cleverly designed to help Portuguese language students learn new vocabulary and sentence construction. 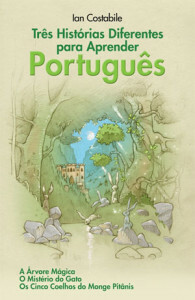 For anyone learning Portuguese – either Brazilian Portuguese or European Portuguese – this book uses different vocabulary, tenses, verbs and sentence structures in each of the three stories to maintain interest and cater to different abilities and interests. Above all, the stories are fun, making language learning fun! Find out more about Ian’s book on his blog Português Azul – where you will also find plenty more inspiration and tips for learning Portuguese. Ian moved from Brazil to the UK in 2009 and it was then that he started to teach Portuguese. A keen musician, he found that many of the people he performed to were interested in the Brazilian language and culture. Members of a local capoeira (Brazilian martial arts) group also came to him for Portuguese lessons. Since then, Ian has qualified as an interpreter and now teaches Portuguese at GCSE and A Level in an Academy in Liverpool. We wish Ian the best of luck with his book! Anyone wishing to purchase his book can do so on Amazon. If you have a language learning or language teaching query that you can’t find the answer to, please get in contact with us either by Facebook or by Twitter, or contact us here. While Brazil is preparing itself for the influx of thousands of people from across the globe for the 2014 FIFA World Cup, those lucky enough to have tickets might find it handy to prepare themselves by learning a little of the language of the host country. 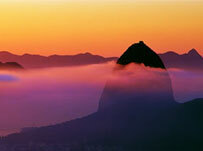 Learn daily essentials and pronunciation by reading our top Brazilian Portuguese phrases. And make sure you know what to shout when you’re watching the game with these essential footie phrases! 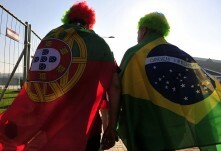 Boa viagem and enjoy the tournament! If you’re travelling to Brazil then don’t miss the opportunity to take a Brazilian Portuguese course while you’re there. Cactus offers courses in 3 locations close to World Cup venues: Rio de Janeiro (closest stadium Maracaña), São Paolo (closest stadium Arena de Itaquera) and Olinda (closest stadium Arena Pernambuco). We also offer Portuguese evening courses in London and locations across the UK. Our next 10-week courses start in July. Time to step into a whirlwind of shimmer, samba and non-stop partying! Every year over 500,000 foreign visitors are attracted to the world’s biggest party, the Rio Carnival in Brazil. The festival causes the whole city to come to a complete standstill for a week as celebrations continue throughout the day and night. Traditional samba music is played and danced to and colourful costumes and floats parade through the streets. This vibrant and colourful festival is usually held in February or the beginning of March, the week before Lent. The celebrations start on a Saturday and finish on fat Tuesday (Marti-Gras). Check out our top tips and essential Brazilian Portuguese carnival vocabulary to make sure you make the most of your trip! 1. Organise and book your accommodation well in advance! 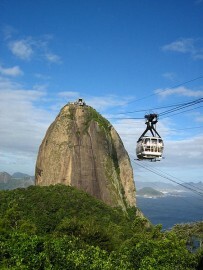 The best hotels in the zona sul (South Rio) get booked up very early! 2. Buy your Rio Carnival ticket in advance. Tickets to watch the parade can sell out months beforehand – and although ticket prices to watch the Sambadrome parade can reach $200, it is definitely worth seeing! (The best viewing is in section 13). 3. Ensure you have your carnival costume ready and indulge in the Brazilian festival and culture. Let you hair down and dance with the locals and you’ll really feel part of the festivities. 4. Make sure you have plenty of money before the carnival starts, as banks are closed for the week and cash deposit machines are known to run dry. 5. The best form of transport for getting around the festival is a taxi, as they are not very expensive. 6. Make sure you get a map of the local blocos (street parties) so you can enjoy the after party into the early hours of the morning! Do you speak English? Fala Inglés? How much is a ticket? Quanto custa uma passagem? I like your outfit Eu gosto da sua roupa. How do you get to the parade Como faço para chegar ao desfile? I think they are the best samba school Eu acho que eles são a melhor escola de samba. I need to buy a costume Eu preciso comprar uma fantasia. I love to party Eu amo festejar. Cactus specialises in organising language courses for individuals and groups, having done so since 1999 for clients all over the globe and for diverse needs and budgets. Our expertise in the field of face-to-face tuition is second-to-none. With an extensive network of approved teachers and a strong in-house academic team, we are able to tailor a language course to suit your specific learning needs, anywhere in the world and whenever is convenient to you. http://www.cactusworldwide.com/blog/wp-content/uploads/2013/03/sugar_loaf_mountain.jpg 270 203 Simon Ager http://www.cactusworldwide.com/blog/wp-content/uploads/2013/07/cactus-blog1.jpg Simon Ager2013-03-19 08:06:262014-02-25 11:50:09Top Brazilian Portuguese phrases! Over the next decade, Brazil, Russia, India and China – the ‘BRICs’ countries – are set to become an increasingly powerful force in the world economy. Together they contribute over a third of world GDP growth, and Brazil – the largest country in South America and the largest Portuguese-speaking country in the world – will soon replace the UK as the world’s sixth largest economy. Brazil is indeed in a strong position at the moment. As 2011 dawned, it swore into office its first ever woman President, Dilma Rousseff, who replaced the man who had become the most popular president in the country’s history, Luiz Ignacio Lula de Silva. Big shoes to fill, certainly, but having served within Silva’s government for seven years, Rousseff is keen to consolidate the work of her predecessor and welcome in a new era for Brazil; the eradication of poverty and reduction of inequality being two major challenges. Rousseff’s drive to tackle poverty may well be helped by Brazil’s potential as a major global oil producer. Recently-discovered offshore oilfields such as Tupi and Libra have provided billions of barrels of oil over the last few years, their discoveries making Brazil one of the world’s top 10 oil producers. Future oil revenues will be valuable in funding the reduction of poverty as well as investing in areas such as education and technology. 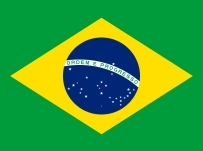 President Rousseff’s term in government will also see Brazil host the Rio Plus 20 global environmental summit, in 2012, and the FIFA World Cup in 2014. Those wanting to make the most of Brazil’s huge potential by doing business here may consider language training in Brazilian Portuguese, which can be critical to establishing relationships and to future success in this fast-developing country. On a similar vein, cultural training is helpful for employees who are looking to relocate to, or spend a prolonged period of time in, Brazil; not only does cultural training help to prevent culture shock, it can give a valuable insight into your target destination’s core values, local business practice, hierarchies and gender perceptions within the workplace, how to address your counterparts and more. Like language training, it can give you a step ahead of your competitors when it comes to integrating into and understanding Brazilian life. Cactus Language Training offers all types of language and cultural training for relocation and other purposes. Specialising in tailor-made language training for businesses and individual needs, training is available in many different formats and in languages and locations across the globe.